Fresno High School is a four-year secondary school located in Fresno, California. 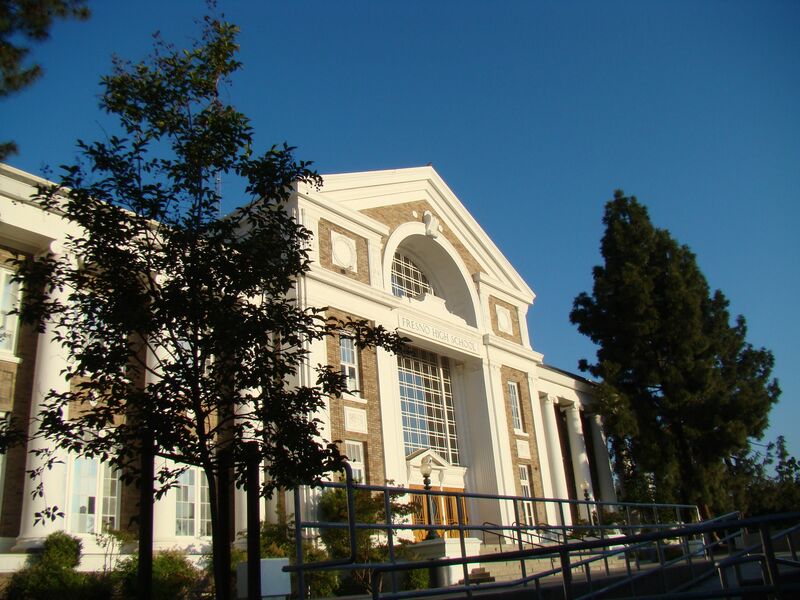 Fresno High is the oldest high school in the Fresno metropolitan area and one of the few International Baccalaureate schools; in addition it continues to be the most populous and most diverse campus in Fresno. The growth of Fresno during the boom period of the 1880s brought about many changes, including the need to establish the city’s first high school in 1889. It was named Fresno High because it would serve all people in Fresno. The first classes were held on September 16, 1889, on the second floor of the K Street School, located at Santa Clara and K (now Van Ness Avenue) streets. T.L. Heaton was the principal. The curriculum was classical——four years of Latin, English, history, science, and math. In June 1891, the first commencement ceremony was held at the Heaton Opera House. Seven students graduated. The new school quickly outgrew the available space and had to be moved to the White School, where the Memorial Auditorium is located today. Plans for a new high school building were developed. In September 1896, the school year began in the new building on 0 Street between Stanislaus and Tuolumne streets. The new back structure, with its clock tower, had the latest and most modern facilities, including a library, a chemistry laboratory, a gymnasium, and a theater-style lecture hall. Some people felt it was too far from town and that the land, which cost $7,500, was too expensive. In 1922, the school moved to its present site on Echo Avenue. More than a hundred years after its founding, Fresno High continues to serve Fresno's students. The curriculum, though, has been broadened to meet the needs of the world's professions. However the opportunity to pursue a classical education, including the study of Latin, is still available to the students of Fresno High School. Fresno High School has foundations dating back to the 1800s. Fresno's second high school was originally located in downtown near "M" Street. The school was relocated several times. Freshmen students were once sent one-fourth of a mile away from their school to the Hamilton K-8 magnet campus. Fresno High School's current location is at 1839 North Echo Avenue, near Palm and McKinley Avenues. Fresno High School is surrounded by large homes (originally in one of Fresno's affluent areas) and large Fresno ash and pine trees. The campus retains most of its history and is one of the few schools to hold on to its original architecture. During 2002 the historic Royce Hall building caught fire and suffered minimal damage. Fresno High School is one of the few accredited schools in the Fresno Unified School District to offer its students the full International Baccalaureate diplomas. The school has been offering its graduate students full IB diplomas since June 2007. The campus offers several advanced placement courses and requires the study of foreign language in order to receive a diploma, along with the completion of a 4,000 word essay and 150 hours of community service. The campus has received poor academic achievement scores in the past, but it has shown impressive improvement. The campus employs 133 full- and part-time instructors, in addition to several guidance counselors, classified staff, administrative employees, one full-time psychologist and one full-time family therapist. The campus offers Spanish, French, Latin, and German language courses. Tatsuya Kaname's Mitakihara Magi lost a key part of the recruiting war when local 5-star WR Kim Sanseo committed to the Notre Dame Fighting Irish more than a week before his scheduled visit on Oct. 30 against Fresno State. The news caused Coach Kaname to hold a meeting with graduate assistant/recruiting coordinator Alex Sanders and athletic director Mami Tomoe regarding the direction of the Magi football program. "We had defeated Notre Dame earlier this season, and Sanseo still elected to choose the Irish despite that fact," Coach Kaname said afterwards. "As a coach, I have learned that we could beat an opponent in the recruiting race and still lose the war against that same opponent despite throwing everything and the kitchen sink. "It's a pity that Sanseo chose not to play for our team, but we will soldier on without him. But this forces us to make a tough decision: do we stay in the Mountain West? Or do we go independent once again and schedule the best teams in college football. "We're going to talk with students and also with the admins to see what they think of where this football team stands. The media seem to have been vindicated by their crucifixion of our schedule with Sanseo's signing with the Irish. We expect to have a final decision at the end of the college football season." This week, Mitakihara Magi head football coach Tatsuya Kaname elected to activate the second string and give quarterback Nic Johnson some playing time. Johnson passed for 168 yards and a touchdown but it was his legs that told the story. He rushed for 413 yards and five majors as the Magi eased past the Nevada Wolf Pack in the snow at Mitakihara Stadium in Mitakihara Town, B.C., 164-7. In addition to Johnson, the usual suspects were at the helm toting the rock. Halfback Rob Wade ran for 320 yards and three touchdowns, halfback Marques Murray ran for 176 yards and three majors, fullback John Nelson rushed for 54 yards and five scores, halfback Fred Jackson rushed for 121 yards and three touchdowns and backup quarterback Brendan Lewis also ran for a major. Wide receiver Timothy Fernando led the receivers with three catches for 99 yards and a touchdown while fellow wideout Justin Rucker added 10 pancakes. Right tackle DeMario Childs, though showing promise with his 10 pancakes, proved he still has a ways to go with stopping the pass rush after allowing three sacks. Speaking of sacks, left end Chris Stephens made five sacks to pace the Magi's pass rush. Mitakihara's leading tackler on Saturday was cornerback Chris Robinson with 15 tackles and an interception. Defensive tackle David Williams and right end James Curtis added three sacks, and Williams also recovered a fumble in the end zone for a touchdown in the fourth quarter. Madoka take the week off before concluding a successful home stretch on Oct. 30 against the Fresno State Bulldogs. Despite the waves of blowout victories for Tatsuya Kaname's Mitakihara Magi, the coaches and media are unconvinced by the results and have elected to place their sixth in both polls, above Mountain West Conference West Division rival UNLV. However, Coach Kaname isn't too concerned about the recent shaftings by the pollsters. "There's a number of reasons why I am not concerned about the polls at this point in the season," Coach Kaname said at a press conference on Wednesday at Hakurei Centre. "First of all, we're only at the midway point of the regular season. A lot of the teams above us—Navy, UCLA, Texas A&M, East Carolina—those teams could stumble later in the year, especially the Bruins and Aggies. "Secondly, we're winning. And we are capable of keeping our decades-old win streak alive. We are fully aware that if we keep on winning ball game, the teams above us will fall and get out of the way. I have told the players numerous times, keep playing our game and win, and let the football gods do the rest. "Finally, our team likes to play a different game other than the national championship. If we finish third in the BCS standings and we are conference champions, we get to play in Pasadena. If we go unbeaten and we're in the top two, we still get to play in Pasadena, but this time we get to defend our Four Corners. Either way, the message is simple: Pasadena Or Bust. If we win out, and that's ONLY if we do, we're heading to Southern California. "So nobody out here is too worried about the polls. We're simply concerned about playing Magi football at this point in the season." Despite passing for 106 yards and rushing for 287 yards and four touchdowns, Mitakihara Magi quarterback Robert Harwell suffered a strained shouled in the 150-17 victory for Tatsuya Kaname's Magi over the Utah State Aggies at Mitakihara Stadium in Mitakihara Town, B.C. The diagnosis was grim: Harwell would be sidelined for two week and would not be available until Oct. 30 against Fresno State. In his place was the offensive captain, Willie Jones, who passed for 166 yards and three touchdowns and ran for 100 yards and three more scores. The ground gave was led by fullback Zach Howe and halfbacks Rob Wade and Tommy Washington. Wade ran for 136 yards and two touchdowns, Washington ran for 235 yards and four majors and Wade rushed for 237 yards and four more scores. Wide receiver Mike Smith led the receivers with three catches for 114 yards and two touchdowns and also paced the blockers with 29 pancakes. Fellow wideout Nate White had 19 pancakes and caught caught four passes for 57 yards and a score. Middle linebacker Steve Meyer led the tacklers on defense with 17 tackles, left end Travis Parrish had five sacks, and both free safety Jeff Donaldson and cornerback Tony Hubbard had two interceptions each. "It's a tough loss to see Robert go down like that but this will be an opportunity for the other signal-callers to throw themselves into the fray," Coach Kaname said after the game. "We plan to go right ahead and activate the second string next week against the Nevada Wolf Pack. We expect Nic Johnson to get the start on the 16th, he's ready to go." Madoka improve to 6-0 and host Nevada next week." 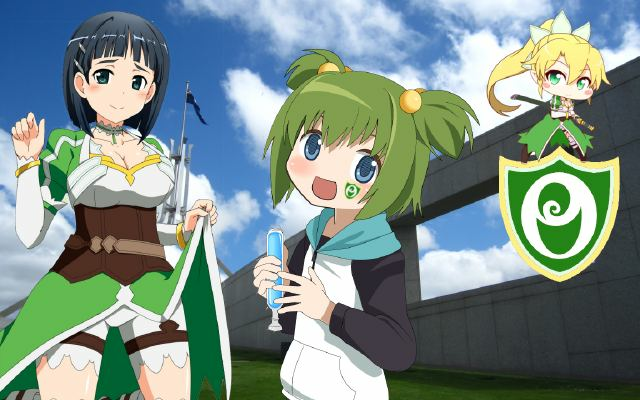 Suguha Kirigaya, the provost at Leafa College, and the college's Executive Director of Sports and Fitness, Yuma Chitose. The Leafa College Spirit American Football Club are the newest addition to the New South Wales Gridiron Football League in Australia. Their head coach is former Mitakihara Magi linebackers coach Shaun Kirigaya, and the attitude is winning games big. Thanks to Coach Kirigaya, there is a strong interest in gridiron in the nation's capital, and the Executive Director of Leafa College Sports and Fitness, Yuma Chitose, is excited about the hire. "When we hired Shaun, we knew we were hiring a winner," Chitose said, watching practice at Mandawuy Yunupingu Field, the home of Leafa's gridiron, athletics and soccer teams. "He loves Australia, its hospitality and its friendliness. Shaun is the type of person you can have a beer with or watch NRL with. He's that approachable. "When he assembled the coaching staff here at Leafa College, he had the best of everyone from New South Wales and Queensland. Jeff Ogborne, formerly the head coach at Sydney Uni, is now the offensive coordinator, while Rick Diporse, the former head coach of the Gold Coast Stingrays, is the defensive coordinator. Our offensive coaches are NSW-based, while our defensive coaches are Queensland-based." "With that in mind, we have been able to pull out some impressive results, and that comes with recruiting the best out there. We heavily recruit players in the Pacific, Japan, Korea and even in Germany. We started the season with a 70-3 victory over the Bondi Raiders in Week 1, a 63-7 win over the Central Coast Sharks in Week 2, a 52-21 run-up over the Newcastle Cobras in Week 3, a 45-10 demolition over the Northwestern Predators in Week 4, a 42-0 shutout of the Penrith City Outlaws in Week 5 and a 77-10 slamming of the Sutherland Seahawks in Week 6. "This week, we face Sydney Uni for the very first time, and there is a trophy up for grabs: the Friendship Shield. It's a shield that has the logo of the Sydney Lions on one end and the crest of the Mitakihara University System on the other. We will be facing them on the ninth this month, and tickets have been sold out. The bookies have as an overwhelming favorite, but Coach Kirigaya knows that oddds mean nothing and he will get the players focused. "My hope is that we end up winning the national championship on Australia Day if we end up winning the Gridiron NSW title. I want this to be the start of our own dynasty, of our own tradition here at Leafa College. Hopefully, it will inspire our teams to also perform and win championships too, and lift their Spirit higher." TRAX is a three-line light rail system in Utah's Salt Lake Valley, serving Salt Lake City and several of its suburbs throughout Salt Lake County. Its full official name is Transit Express, though this name is very rarely used. The system is operated by the Utah Transit Authority (UTA). All TRAX trains are powered by overhead electrical wires. As of 2013 TRAX has three lines in service. The Blue Line provides service from Downtown Salt Lake City to Sandy (extended to Draper beginning in August 2013). The Red Line provides service from the University of Utah to the Daybreak Community of South Jordan. The Green Line provides service from Salt Lake City International Airport to West Valley City. All of UTA's TRAX and FrontRunner trains and stations, as well as all fixed route buses, are compliant with Americans with Disabilities Act and are therefore accessible to those with disabilities.Signage at the stations, on the passenger platforms, and on the trains clearly indicate accessibility options. Ramps on the passenger platform and assistance from the train operator may be necessary for wheelchair boarding on Blue Line (weekdays only). These ramps are not used on weekends or on the Red or Green lines. In accordance with the Utah Clean Air Act and UTA ordinance, "smoking is prohibited on UTA vehicles as well as UTA bus stops, TRAX stations, and FrontRunner stations". The first line, running from downtown Salt Lake City south to Sandy, was completed in 1999. The second line from downtown to the University of Utah was completed in 2001 and extended in 2003. An extension to the Salt Lake City Intermodal Hub was completed in April 2008. In August 2011, two extensions to South Jordan and West Valley City were completed. Plans called for two additional TRAX extensions to the Salt Lake City International Airport (which opened April 14, 2013) and Draper (to open August 2013). The extensions to South Jordan, West Valley City, Draper, and the Airport were funded in part by a Salt Lake County sales tax increase that would pay for all four of the proposed TRAX extensions. A letter of intent signed with the Federal Transit Administration on September 24, 2007 secured the remaining funding for the light rail lines. Both the University Line and its extension to the University Medical Center were completed ahead of schedule. A daily ridership of 15,000 was expected for the initial 15-mile (24 km) line in 1999. By the beginning of 2008, the expanded system of 17.5 miles (28.2 km) served an estimated 40,000 passengers each day. Ridership for the fourth quarter of 2012 was reported to be at 60,600, making it the ninth-busiest light rail system in the country. Light rail in the Salt Lake Valley was first seriously discussed in the late 1980s to provide an alternative to traffic congestion on I-15, but the idea was met with much criticism. On October 10, 1988, Congress approved $5 million in funds to preserve land along the proposed light rail corridor. Funding for the light rail line itself, however, remained uncertain. After Salt Lake City won the bid for the 2002 Winter Olympics in 1995, UTA used the city's host status to accelerate obtaining funding through the Federal Transit Administration (FTA). Construction began in 1997. Protesters at the groundbreaking insisted that light rail would be both dangerous and a waste of money. Public opinion remained divided and businesses on Main Street in downtown Salt Lake City suffered during the construction period. After the north-south line opened in late 1999 with sixteen stations, ridership expectations were quickly met. The system was enthusiastically embraced by valley residents, to the surprise of many, and once-skeptical communities soon began clamoring for extensions. Funding for the University Line to Rice-Eccles Stadium allowed it to be completed in 2001 with four new stations, ahead of schedule and the Olympics. An extension to the University Medical Center that added three new stations was completed on September 29, 2003, fifteen months ahead of schedule. An infill station at 900 South in Salt Lake City was constructed in 2005, and a second infill station, at 9400 South in Sandy (Sandy Expo), opened in August 2006. On December 13, 2006, the UTA Board of Trustees voted to change the name of the station next to the Delta Center to "Arena" in response to the renaming of the nearby indoor arena to EnergySolutions Arena. On February 23, 2006, plans for extending the main line westward to the current Salt Lake City Intermodal Hub near the Gateway District were approved. Two stations were built near the Gateway shopping district, as well as one at the Salt Lake Central Station (Salt Lake Intermodal Hub). They opened in April 2008, bringing the total number of stations to 28. UTA currently has two service centers for TRAX maintenance: the Lovendahl Rail Service Center, which is just off the Red Line in Midvale, and the Jordan River Service Center, which is just off the Green Line in South Salt Lake. Some time after the game between the Mitakihara Magi and Western Kentucky Hilltoppers, Dr. Madoka Kaname was discharged from the hospital and was physically exhausted after giving birth to her new children, Shiroyuki and Reika. Her oldest child, Magi football quarterbacks coach Akiyuki Kaname, drove her back to the Kaname house, where a similarly exhausted Homura Akemi was waiting. She had been working overtime from her office up in Kaname Hall. 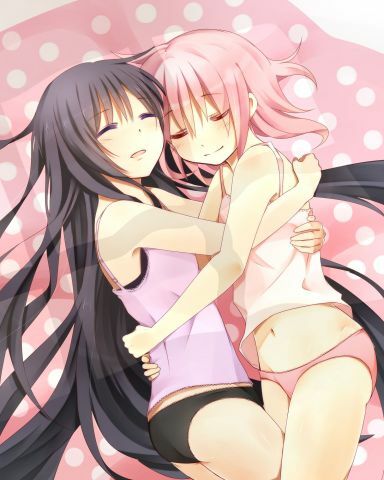 Madoka and Homura both fell into a deep slumber, embracing each other. For the time being, the twins were in the care of Akiyuki and his wife Chiwa. Tatsuya arrived at the house at midnight and retired to his own quarters. Sunday came, and as Tatsuya woke up, he went over to Madoka's room to see how she was doing. He figured that she had returned home after giving birth. Tatsuya opened the door and found Madoka and Homura embracing each other, still asleep like little angels. Tatsuya smiled. Madoka was doing well, and he figured that she and Homura needed the full day off on her birthday. After giving both of them a kiss, he put on a shirt, tie, slacks, a pink sweater and a pink trucker hat, headed to the garage and took out his bicycle for a ride on the town. Biclycling was something Tatsuya wanted to do every now and then but he couldn't because he was a coach. However, even head football coaches needed to get in shape, and this was the way he could do it. He rode through alleyways, highways, and rode to Victoria and back. As he rode on his bicycle, Tatsuya came to terms with his own well-being, and who he was as a person. "I am 53 years old in reality; I am not 16," he said to himself. "When this spell expires, I will be just another guy, another grandfather, another dad." And the big question he wanted to ask himself was, "When am I going to retire?" Tatsuya Kaname loved coaching the game. He loved being out on the sidelines, teaching players the game of football and watching his coaching tree expand and grow. But, there came a point in his life where this was going to end. At some point in his career, he had to call it quits. He wasn't going to do it just yet, but at some point in his life, perhaps in his mid-70s, it was going to happen. Mitakihara Magi football quarterbacks coach Akiyuki Kaname was unable to coach the quarterbacks on Saturday in Homecoming 2049 against the Western Kentucky Hilltoppers, due to his mother, university founder and chancellor Dr. Madoka Kaname, giving birth to fraternal twins Reika and Shiroyuki Kaname that evening. Head coach Tatsuya Kaname was left to coach the quarterbacks and they were instrumental in dismantling WKU, 255-52. Starter Robert Harwell passed for 465 yards and 10 touchdowns while rushing for 181 yards and another score. Backup quarterback Willie Jones ran for 115 yards and another major. The ground game was led by halfbacks Rob Wade and Tommy Washington. Wade ran for 338 yards and five touchdowns while Washing ran for 246 yards and three scores. Halfback Fred Jackson ran for 38 yards and three more majors while fullback Zach Howe ran for 120 yards and two more touchdowns. Wide receivers Mike Smith and Nate White led the Magi receiving corps on Saturday night. Smith had five catches for 119 yards and three touchdowns while while had four receptions for 112 yards and two scores. Wideout Justin Rucker had three receptions for 82 yards and two majors while Washington had three catches for 97 yards and another touchdown. Rucker also led the blockers with 17 pancakes. Free safety and defensive captain Jeff Donaldson led the defense with seven tackles and five sacks. Left end Chris Stephens had four sacks while cornerback Shedrick Johnson added four interceptions. "Overall, I'm glad that Madoka was able to give birth to twins without any issues or problems," Coach Kaname said after the game. "She told me that I had to coach the game, and I did. When I told the players the news, they celebrated like it was also their kid that was born. It was a great performance by everyone involved." Madoka improve to 5-0 and host Utah State next week. The Mitakihara Homecoming Committee released the schedule for Mitakihara Homecoming 2049: On The Up. Lin Yi Ling, a senior chemistry major from Kaohsiung, Republic of China, is this year's Homecoming Chair. Lin was excited about this year's Homecoming Week and the theme for this year's edition. "We are on the up, we are on the rise," said Lin in an interview at Magia Quad. "We are see our graduation rates improve. Our professors are getting more sophisticated in their teachings styles. Online learning is skyrocketing. And our student body is getting better in terms of smarts and savvy. "So, to celebrate the fact that Mitakihara University is progressing as an institution of higher learning, we are calling this year's theme 'On The Up.'" This year's homecoming will also see the debut of the university's newest fight song, "Fight On, Mitakihara!" written by Robert Harwell '50, Margaret Williams '50, Alice Kirkland '49 and Emily Jones '49. Lyrics can be seen on the official home for Magi football, MitakiharaMagi.com. A number of events will take place leading up to the Homecoming Game against the Western Kentucky Hilltoppers on October 2, 2049 at 8:00 p.m. PT/10:30 p.m. ET. The game will be televised by TSN 2, ESPN 2, NHK and BBC. St. Francis Friary, Edmonton, Alb. Special Exhibit at Saito Library: The Future of High Speed Rail Networks, sponsored by Canadian National Railway. For more information, please visit the Saito Library website. Featuring Mitakihara Magi Athletics team doctor Rika Shiguma, M.D. Tickets required: $40 for adults, S25 for students and seniors. Tickets can be purchased directly through the Mitakihara Box Office by phone at (250) 4MADOKA or online at the box office website. The tradition continues! See your favorite local bands battle for cash prizes and a recording contract. Many distinguished musical guests and music industry executives will be on hand to witness this exciting, electrifying occasion. Tickets required: $35 for adults, $25 for students and seniors. Tickets can be purchased directly through the Mitakihara Box Office by phone at (250) 4MADOKA or online at the box office website. Following the Women's Volleyball game vs. the British Columbia Thunderbirds, the 2047 Mitakihara Magi Football Team will be introduced. Speeches by head coach Tatsuya Kaname, offensive team captain Willie Jones, defensive team captain Jeff Donaldson, athletic director Mami Tomoe and university president Homura Akemi will be made. Pack a picnic and set up a tailgate with your friends prior to the Mitakihara-Western Kentucky football game. The Madoka Tailgate Area will be located inside Gate 13. Cars can park here for $20, payable on-side. Tailgate is permitted for 2 hours prior to kickoff and for one hour following the game. More information can be found at the Athletics website. Cheer on the Mitakihara Magi as they take on the Western Kentucky Hilltoppers. A block of tickets for Madoka Homecoming is currently reserved through the Mitakihara Athletic Ticket Office. Tickets are required and cost $18 each, children ages 12 and under are free. Tickets can be purchased directly through the Mitakihara Box Office by phone at (250) 4MADOKA or online at the box office website. Get ready to put on your running or walking shoes and take a cruise around the different places on campus and in Mitakihara. The route starts at Magia Quad and will weave around the city before ending at Madoka Square. Registration is $50.00 ($25.00 for students with ID) at the Magia Quad tent from 6 a.m. to 8:30 a.m. All proceeds benefit the BC Cancer Foundation. Refreshments and medals will be provided at finish line. Quarterback Robert Harwell passed for 465 yards and six touchdowns while rushing for 136 yards and four more scores as Tatsuya Kaname's Mitakihara Magi drubbed the Colorado Stater Rams, 239-24, at Mitakihara Stadium in Mitakihara Town, B.C. A healthy mix of pass and run, as well as some brilliant pass rushing, turnover-forcing and special teams returning, were the order of the day against an overmatched Rams squad. Backup quarterback Willie Jones passed for 113 yards and two touchdowns while rushing for 156 yards and two more majors. Halfback Tommy Washington ran for 77 yards and five scores, halfback Rob Wade ran for 89 yards and a touchdown, halfback Marques Murray ran for 38 yards and a major and fullback John Nelson ran for 91 yards and a touchdown. Wide receiver Nate White led the way with five catches for 156 yards and three touchdowns, while wideout Mike Smith caught a couple of passes for 124 yards and a score. Also with a catch for a touchdown were Wade, Washington, wideout Timothy Fernando and tight end Travis Murphy. Wideout Justin Rucker led the blockers with 12 panckaes, while Smith and White had 11 each. Freshman free safety Larry Bernard led the tacklers on defense with 18, but he wasn't the star of the show on the Morning Rescue D. That honor belonged to senior strong safety Andy Williams, who had five interceptions and four interceptions, including one going the whole 100 yards for a pick six. Right outside linebacker Derrick Bowman led in sacks with seven and middle linebacker Steve Meyer added six. Right end Lawrence Blair and left end Travis Parrish also had five sacks each, while cornerback Shedrick Johnson had three picks. "This was another solid effort from the team, but we also gave up a few sacks, especially late in the second half," said Coach Kaname. "No matter what the margin, our offensive line need to stop sleeping and continue working on stopping the pass rush because that is the strategy that our opponents will be using from now on." 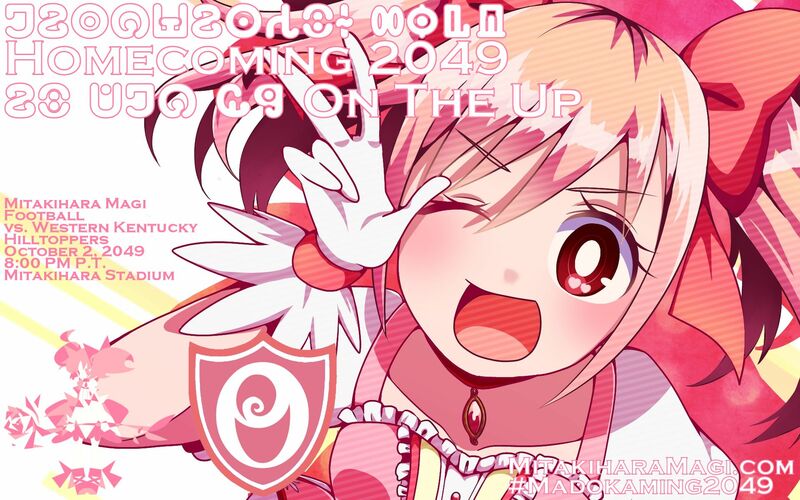 Madoka improve to 4-0 and host the Western Kentucky Hilltoppers next week in Homecoming 2049. The Fort Collins Museum of Discovery is a partnership of two educational institutions that merged in 2008 to create a combined science and cultural resource for Fort Collins and northern Colorado. The Fort Collins Museum began as the Pioneer Museum in 1941 with the help of the Indian Relic Hobby Club, the Pioneer Association, and the Daughters of Colorado Pioneers. Operated by the City of Fort Collins, the Museum's first curator was Clyde Brown, a member of the Indian Relic Hobby Club and a Fort Collins native. In 1976, the Pioneer Museum relocated into the old Carnegie Library building and became the Fort Collins Museum. The Museum has evolved into a regional center focusing on area history and culture. The Fort Collins Museum's collection totals over 30,000 artifacts, including a significant collection of Folsom materials from the Lindenmeier Archaeological Site north of Fort Collins, agricultural implements, household necessities, paintings, and clothing, reflecting the diversity and values of the peoples of the Cache La Poudre River Valley. Multiple galleries feature temporary and permanent exhibitions, and four historic structures – three cabins and a schoolhouse – reside in the outdoor Heritage Courtyard, including "Auntie" Stone's cabin, the oldest cabin in the Fort Collins area. The Museum also offers a variety of on-going programs and educational opportunities and is home to the Local History Archive. Discovery Science Center was founded in 1989 as a non-profit 501©(3) organization with a mission to provide enjoyable, hands-on explorations in science and technology for the region. Discovery Science Center houses more than 120 interactive exhibits designed to engage learners of all ages, offers an array of planetarium shows, overnight camp-ins, and classes, and makes these resources highly accessible by providing scholarships and free family memberships to qualified participants. Discovery Science Center fosters science literacy among the community’s school aged children by providing challenging, enriching opportunities in hands-on science education, helping ensure that they develop a passion for lifelong learning. Since 1993, Discovery Science Center has also hosted the Poudre School District’s annual Science Fair. Camp Hale, between Red Cliff and Leadville in the Eagle River valley in Colorado, was a U.S. Army training facility constructed in 1942 for what became the 10th Mountain Division. It was named for General Irving Hale. Soldiers were trained in mountain climbing, Alpine and Nordic skiing, cold-weather survival as well as various weapons and ordnance. When it was in full operation, approximately 15,000 soldiers were housed there. From 1959 to 1965, Tibetan guerrillas were secretly trained at Camp Hale by the CIA. The site was chosen because of the similarities of the terrain with the Himalayan Plateau. The Tibetans nicknamed the camp "Dhumra", meaning "The Garden". The CIA circulated a story in the local press that Camp Hale was to be the site of atomic tests and would be a high security zone. Until the camp was closed in 1964, the entire area was cordoned off and its perimeter patrolled by military police. In all, around 259 Tibetans were trained at Camp Hale. After Camp Hale was dismantled in 1964, no Tibetans remained in Colorado. From 1958 to 1960, Anthony Poshepny trained various special missions teams, including Tibetan Khambas and Hui Muslims, for operations in China against the communist government. In 1965, Camp Hale was dismantled and the land was deeded to the U.S. Forest Service. Since 1974, the area has become a youth development training center. An Eagle County non-profit organization, SOS Outreach, has used the site to expose disadvantaged youth to many of the same outdoor challenges experienced by the 10th Mountain Division. In 1962, Pete Seibert, who was among the soldiers who trained at Camp Hale and then returned to the area after the war, founded the Vail Ski Resort nearby. In 2003, the U.S. Army Corps of Engineers began a cleanup effort to remove some of the unexploded ordnance at the site in conjunction with several other government agencies. This effort is still ongoing. 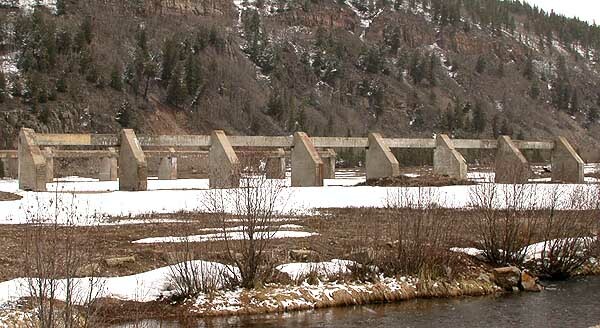 Most of the remnants of Camp Hale are located in the White River National Forest. There are camping grounds where overnight camping is permitted on this former army base. Several informational plaques are located throughout the area. These plaques contain historical information about camp construction, the 99th Infantry Battalion (aka "The Viking Battalion"), ski training, rock climbing/alpine training, the motor pool area, CIA training, and camp entertainment. Days after Tatsuya Kaname's Mitakihara Magi stormed past the West Virginia Mountaineers in the pouring rain, Coach Kaname received a phone call from a certain QB recruit. "Hello?" he asked in Japanese. He was busy at his office at Hakurei Centre. "Who is this?" It was Haruyuki Arita again. "Coach Kaname, it's me, Arita." "Hey there! How you doin'?" "Great. Listen, Coach, I want to thank you for allowing me and Saku-chan to visit Mitakihara University. The people are fantastic, the setting is great, and your team played an amazing game." "Great. Glad to hear that. Our players put in a great shift and won big. Have we made up your mind yet?" "You have. I'm signing with you, effective today." "I expected that decision, Haru. Even though this is over the phone...Haruyuki Arita, welcome to the Mitakihara Family." "Thank you, Coach, I am excited to join this tradition of success for my favorite team in all of college football. It's been my dream to be a part of this experience, and now I get my chance." "Well, I am thrilled that you have chose the Magi over all other. Now that you have committed to us, we will be contacting you over the next several months to make sure you are transitioned into campus life here without any problems. How are you doing with your classes?" "Good," he said. "I am tops in my class, and I have been getting high marks on my subjects." "At Mitakihara, we value the importance of academics. So it's crucial that you finish school, earn your diploma, also pass your TOEFL..."
"English language. We want to make sure you are able to handle talking in English, even though our official languages at this school are English, French and Japanese." "So, the plan is simple, Haru. Finish your classes, graduate, and go through the process of being a student here. Since you will be on scholarship, we will do whatever we can to accomodate you." "Do you have anything else for me?" "No, Coach, I just want to say that it's an honor to be a part of the Magi, and I will do my best to help you win ball games. I love football and I love everyone in Canada." "Thanks, Haru. We'll keep in touch through phone and email. We'll see you in person in the summer! Take care of yourself." "Indeed." And Coach Kaname hung up. Haruyuki put down the phone and turned around. "Who were you talking to?" asked Kuroyukihime. "Coach Kaname. I decided to sign with the Magi. I did it." "Congratulations. Perhaps we should...celebrate your accomplishment?" He turned into a pig. "Um...I guess...I like where this is going?"